Abanal is a Redguard merchant who can be found in Northpoint. 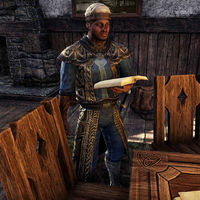 He walks around the Marketplace, stopping at Northern Lights Bazaar, the unmanned stall next to the Mages Guild, and an open crate in the marketplace building. When spoken to, he tells you, "I'm looking for someone, and she is not you. Leave me be." This page was last modified on 3 May 2018, at 00:47.